Before today, you never realized I had all the answers, did you? You never knew that I held the key to understanding how to communicate with a man? I am surprising myself, really. The vast knowledge I unknowingly possessed didn’t become obvious to me until tonight. We were out eating with my sister and her husband, the unfortunate couple who now houses my family of four until we find a house of our own, when I began discussing how to approach a man when you want something. I’m not talking about the salt and pepper at dinnertime, ladies, I’m talking about big things like…him going with you to a wedding he doesn’t want to go to, him being okay with a big shindig with lots of your girlfriends at your house which means he will have hole himself up in another room or go somewhere else while footing part of the bill, him “babysitting” his own kids plus a few more while you go to a baby shower or something. You know…things he doesn’t really want to do. Your man may be different. Your man may love going to weddings of complete strangers, but many don’t. Mine included. For sure. So, I’ve developed a plan. Actually, the plan has been there all along. You probably follow it. If you presently do not have a man, you probably followed this when you did have one or you have seen people close to you follow it or you are just super smart. Every woman knows the plan. I’m just writing it down. For the sake of illustrtation, let’s pretend that you are wanting to ask your man to go to a wedding of a second cousin twice removed to the 11th power that he has never met. You really, really want him to go, but you know he would rather cut the entire front yard with child-safe scissors than go to that wedding. You know he saw the wedding invitation come in the mail and has purposely ignored it. You are pretty sure that if you don’t put the invitation in a safe location fast, he will coat it in lighter fluid and throw it into a metal trashcan he bought just for the purpose of burning unwanted invitations. And pine needles. But, you plan to ask him anyway. You want him at the wedding, dingdangit. STEP 1: SEED PLANTING-About a month away from the wedding, you nonchalantly mention that your second cousin twice removed to the 11th power (let’s call her “Rhonda” from here on out) is getting married. You are not asking for a commitment from him, as you know you will not get one from him at this point. After all, he gave you “the look” as soon as “weh-” came out of your mouth. YOU ARE SIMPLY PLANTING THE SEED. Step 2: FERTILIZING- There are multiple ways of fertilzing the seed you have recently planted, such as having him see you buy clothes, jewelry, etc. for the event, without coming right out and asking your man to come to that wedding with you. YOU CANNOT ASK HIM AT THIS POINT. You never, ever want to ask “Will you go to Rhonda’s wedding with me?” this early in the game. After he asks, “Who’s Rhonda?”, he will say “NO”, which is akin to a flock of birds coming into your garden and fighting over your seed!! One of them will get it or tons will get it, but, either way, in one piece or in several pieces, that seed is history! All of your work was in vain! That seed will soon be coming out of a bird’s hind end in the form of white poo on top of your car! DO NOT LET YOUR SEED TURN INTO WHITE BIRD POO! Step 3: WATERING- You must leave some time between fertilizing and watering. If you go straight from fertilizing to watering, he will know something is up. He will know that you are following some sort of plan. So, after ample time has passed, begin watering that seed. You will do this by mentioning how much fun it would be if he came to the wedding with you, how much you are looking forward to the wedding, how Rhonda will love the Tupperware juggling monkey you got her, etc. If he looks like he is about to object, quickly bring up another subject or pretend your gall bladder has just burst. Step 4: WATCH IT GROW- As the date of Rhonda’s wedding quickly approaches, you will notice that his impulse to object becomes less intense. YOU ARE WEARING HIM DOWN. He will have seen the dress you bought for the wedding hanging up in the closet multiple times by now, especially since you hung it in front of his favorite shirt (good girl! ), and will begin to realize that this is something you REALLY want to do. 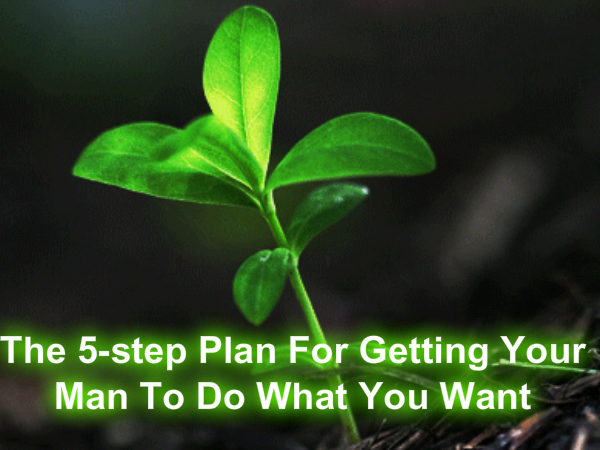 You will see that your efforts in step 1 through 3 have produced a pretty little plant already. You can’t just come right out and say, “So, you’re coming to Rhonda’s wedding, right?” at this point, however, or he may get out the weed-eater and mow down your sweet plant. The timing is just not right yet. Step 5: PLUCK THE SUCKER- No more playing around. The wedding is tomorrow! This is when you mention that childcare has been arranged, the present has been bought and that his white shirt with the new tie he got for Christmas two years ago will look so hot on him tomorrow at Rhonda’s wedding. He will probably go into some spiel about how he never agreed to go to the wedding and he’ll most definitely ask, “Who’s Rhonda again?” This is where you will give him a look of hurt and astonishment. You assumed he was going all along! He doesn’t know RHONDA?! This is news to you! After some huffing and puffing and blowing the house down, he’ll come around and go to that wedding. Finding the Funny is back, but it never really left because we, like, do this every week. I just like to bust out a little Eminem when I get a chance. Anyway, it was awesome to have seen so many new faces last week! Yay!! So much funny in one place. I can hardly stand it. Thanks for linking up your new/old funny posts! Anna and I are grateful you trust it here. Remember that your post shows up here and over at Anna’s place. Know that your posts are happy here, by the way. We feed them Thin Mints and give them fresh water, after all!